Our ability to read DNA has become one the fastest growing technologies ever. Reading all the DNA for a single human is called reading a person’s genome. A human genome is big, it’s roughly 6 billion letters long consisting of G C T and A. Almost every cell in your body contains a full copy of your genome. Half of your DNA from your Mom, half from your Dad. 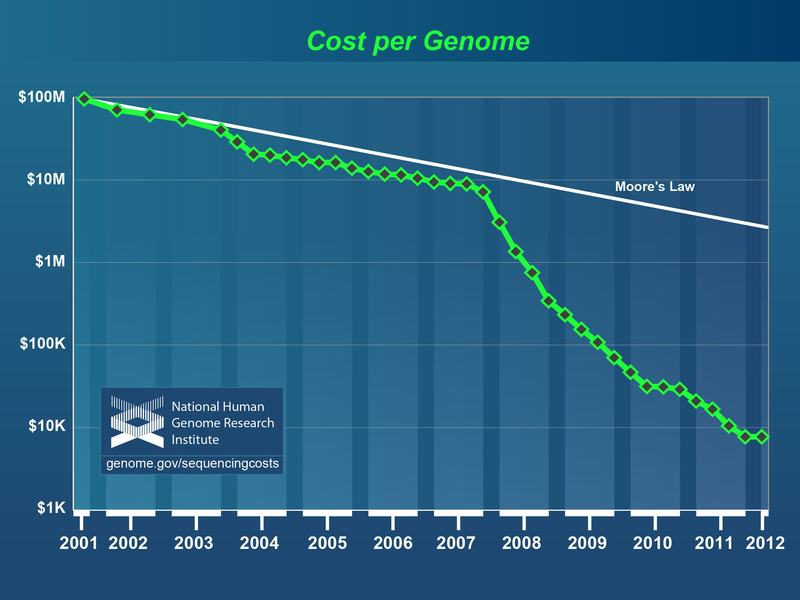 Thinking Exponentially, the cost of reading a human genome has sped up by a factor of at least a 1,000 and dropped in price over a factor 10,000 since 2001. Yes, 10,000 fold improvement in cost alone. For what it cost to read the first human genome, we could read the entire DNA of 10,000 people. The real power is what will be done with all this genetic data. If you read the genomes of many people you can find patterns in disease. Patterns that can be targeted. If those genetic patterns are compared against how they present in a disease, then you have the ability to ask profound questions. This is why I invested in CureTogether and why it was such a great acquisition for 23andMe. A great historical video of genetic sequencing from 1985 to today and where it is going in the near future. Take your thinking one step further, Thinking Exponentially, if you read the entire DNA of every living thing on the planet: Bacteria, animals, plants, cancers cells and all humans. What do you get? The worlds largest software library. One of the key foundations for Synthetic Biology.